This so quick to throw together. 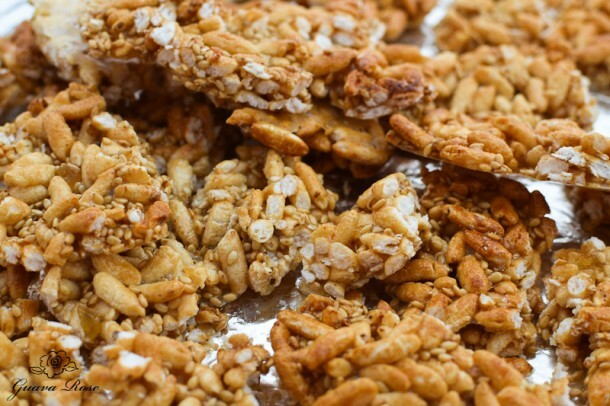 Sweet and crunchy, almost like caramel popcorn, but with a little zing from the ginger. 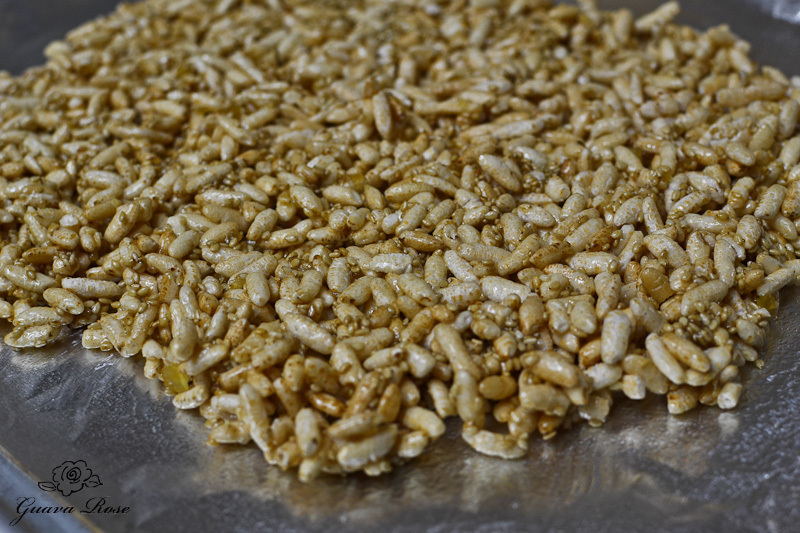 Only 5 ingredients: Puffed Brown Rice or Crispy Brown Rice cereal, toasted sesame seeds, candied ginger, butter, and brown rice syrup. 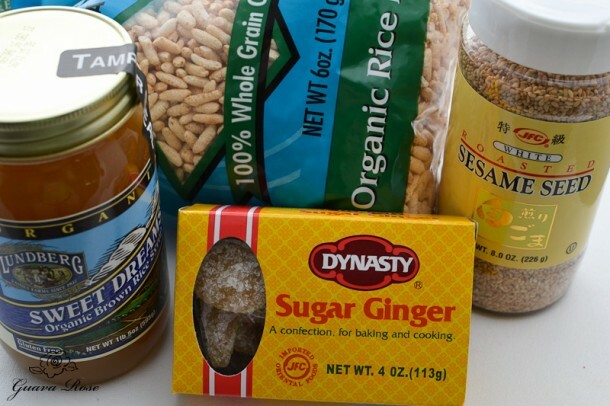 I prefer using brown rice syrup rather than corn syrup because it is less sweet, and less chemically processed. The jury is still out on whether our bodies process them differently, with one promoting more weight gain than the other. Another concern people have is that the corn used in corn syrup comes from genetically modified corn. The long term results of eating such genetically modified crops remains to be seen and determined. 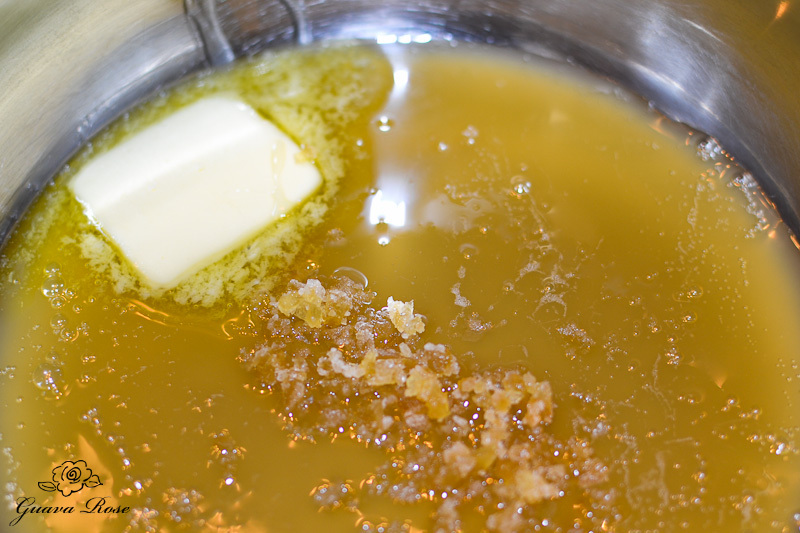 Add the butter, brown rice syrup, and minced candied ginger into a small pot. Heat on high heat and bring to a boil. 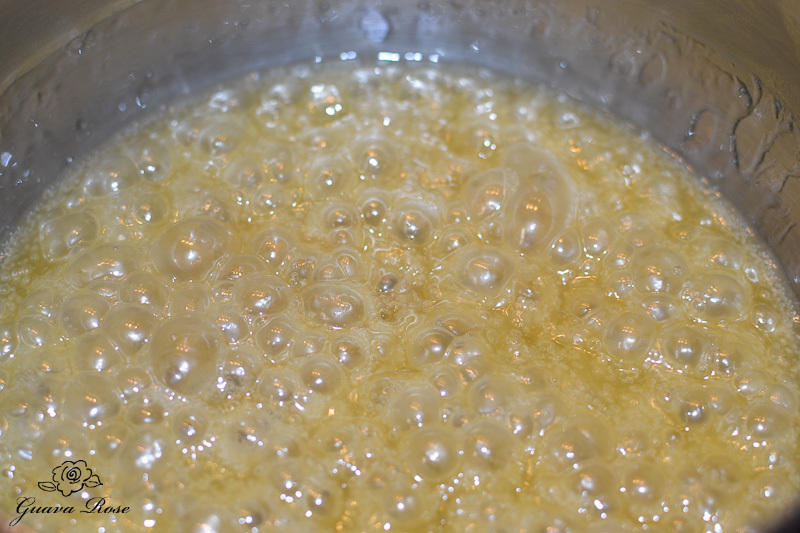 Let it bubble 30 to 45 seconds. 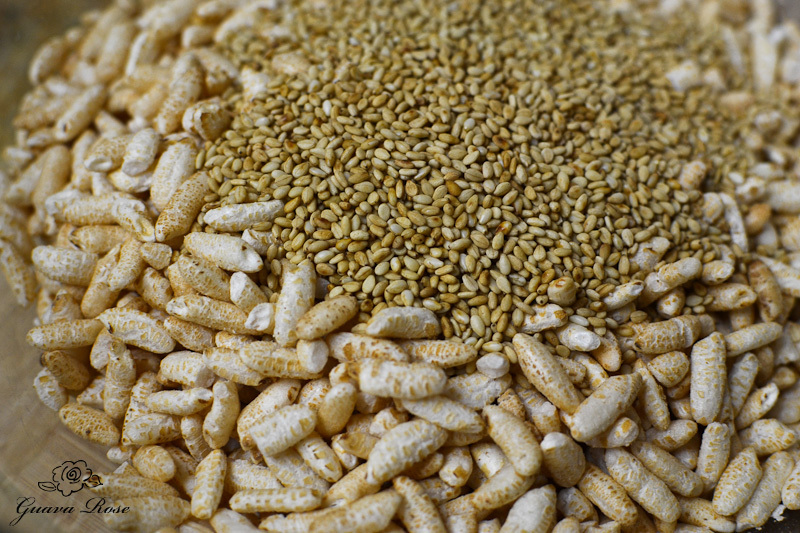 Meanwhile, have the puffed rice and sesame seeds ready in a mixing bowl. Pour the hot gingered syrup over the puffed rice and sesame seeds and mix well. Pour onto a cookie sheet lined with foil that has been sprayed with non-stick spray. Wet your clean hands with some cool water and pat the mixture down flat. Bake at 325 degrees for 13-15 minutes until lightly browned on top. It will still be soft when you remove it from the oven, but will harden and be very crunchy after it has cooled completely. Lift it up and peel off the foil from the bottom. Break into pieces and enjoy. 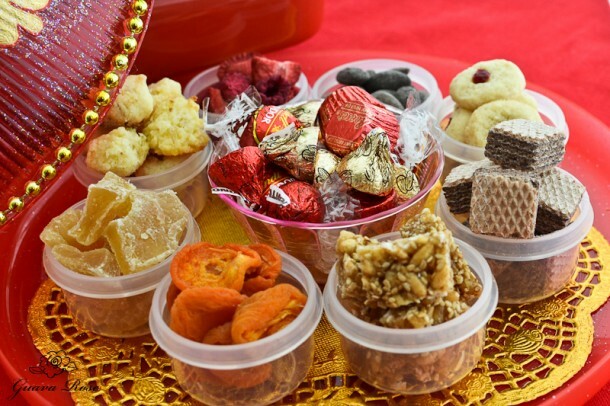 It’s perfect broken or cut into small pieces and put into your Chinese Candy Box for Chinese New Year too. Preheat oven to 325 degrees. Line a large cookie sheet with foil and spray foil with non-stick spray. In a small pot, add butter, brown rice syrup and ginger. Bring to a boil. 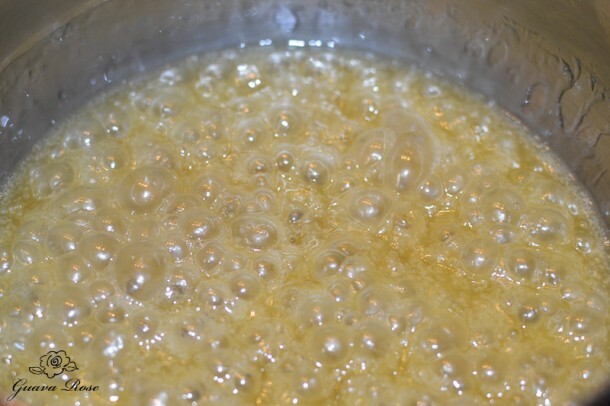 Let bubble 30 to 45 seconds. 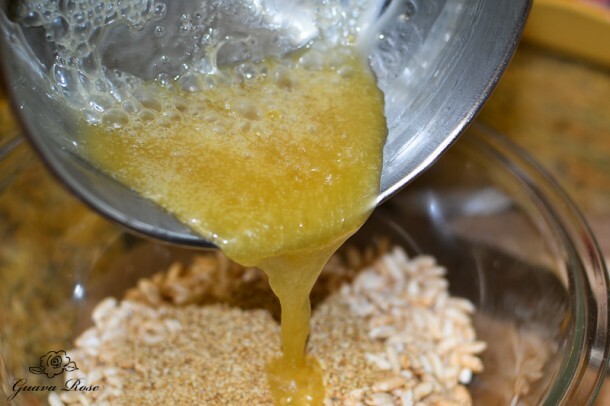 Pour over cereal and sesame seeds. Mix well. Scoop mixture out onto the prepared cookie sheet. Wet hands with cool water and pat the mixture down flat. Bake for 13-15 minutes, until the top is lightly browned. It will still be soft. Remove from oven and let cool and harden completely. Break into pieces. Store in an airtight container.